What are you doing to keep yourself fully alive? Are you energized by your current lifestyle or are there other parts of you crying to be expressed? I’m a yoga dude and I live and breathe yoga, but I’ve recently taken an interest in the art of making traditional wooden longbows and it’s caused a necessary sharing of time and breath with my yoga. As I was practicing my shooting the other day I began to wonder where this interest has sprung from. Has it been hidden inside me all these years? Perhaps it was a seed planted by my inspiring teacher and friend, Peter Yencken, who has taught me a lot and continues to share his knowledge with me. Let me share a little about him. Peter Yencken is an experienced traditional bowyer and craftsman who has worked with Tom Brown’s Tracking and Wilderness Survival School in the United States. 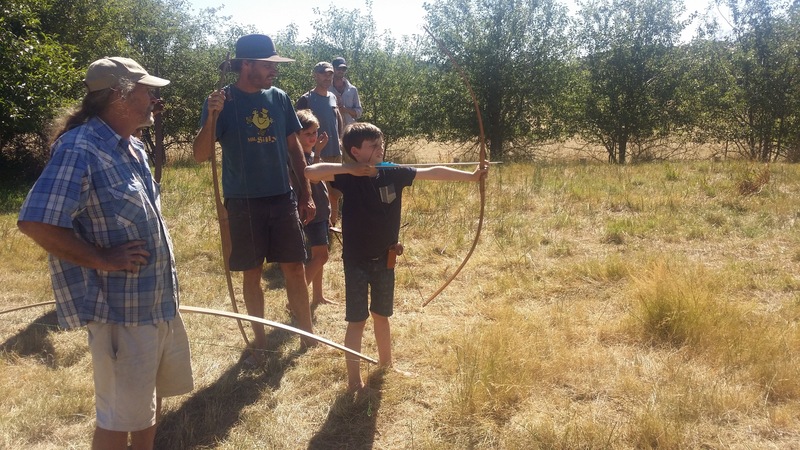 He has taught bow making and other traditional workshops to both children and adults in Australia and the United States for more than 15 years. 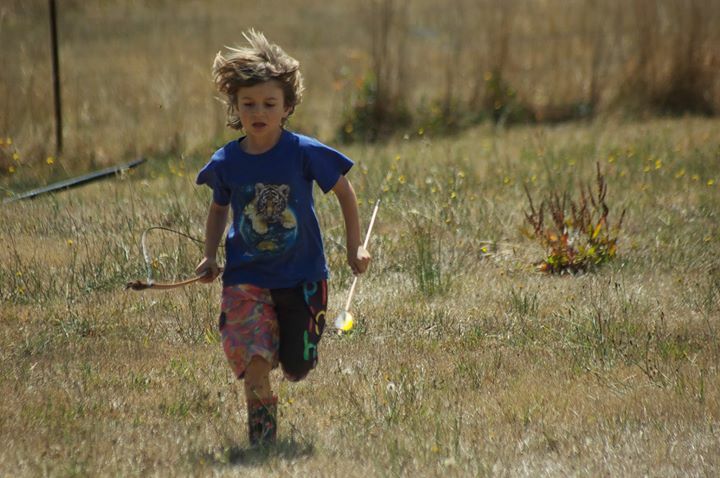 He is your picture of Wild Man with Wilderness skills and more of a dude than I am! I have been learning and working with Peter for over two years. During this time, the people I have met through the workshops we offered found their experience therapeutic, meditative and enriching. The seed was planted in some of them, while other’s found the process grounding, definitely fun, creative, and a great way to work with yourself (& wood!). My persistent curiosity and interest in archery has turned into a passion to match my love of yoga and I now love to share the art of making a bow with others. So just this past week I took another piece of spotted gum, and this photo shows my first creation in 2015. While I was working with file and rasp and sanding it, I thought to myself how much pleasure I was deriving from this simple repetitive motion, and certainly more nourishing to me than staring at my computer screen. I’ve made one resolution for the year 2015: less laptop work, more woodworking and more yoga and archery in nature! Simply observing the changes in the wood after a stroke with my file or rasp keeps my mind focused. Awareness is needed as the rasp can do damage at any moment, damage to the wood or damage to the hand. I have experienced a cut from the many sharp teeth from my rasp. Being present is way more pleasant. This answers my earlier question of where my interest in longbow’s has sprung from; of course it is deep within me and intimately linked with my passion and knowledge of yoga. They are complimentary forms of working with the body. Crossing paths with Peter just after reading Krishnamacharya’s words was the beginning of my adventure into archery. Such synchronicity! 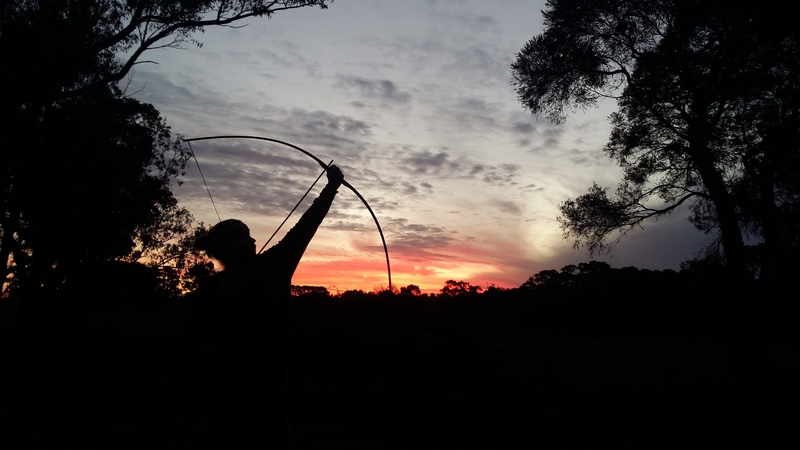 Complimentary learning; the art of bow making, the intuitive shooting method and my ever deepening Yoga practice and teaching for a healthy body and mind. Yoga and Archery are similar in their experiential example of the duality in our earthly life and puts us in good stead to travel our path towards oneness. A bow is a simple mechanism that has been used for centuries and also a powerful weapon designed to take life. In order to make a good bow a great amount of sensitivity is required. You need to console and communicate with the wood material. Every fiber in the wood has it’s own reason and function for being and only through co-operation and harmony among them it becomes a great bow. Yoga offers that in a similar way – the movements and postures work in the world of dualities and our body is a complex system where every cell does what it can do best and every cell co-operates with each other. Creating harmony, oneness, a place without judgment and competition where nobody is left behind and each accepted for who they are like the fibers in a bow. There is a lot of learning in the process, learning on a deeper level that will unfold when needed in our daily lives. The bow resembles me and I resemble the bow. My bigger goal is to help create a new way of living, a world based on co-operation and working together, a place where the strongest is flexible, and the vulnerable is resilient. A part and a place for every one – The Village Continuum – is another project I am working on with that vision. I will write about that a later date and you can also check out my blogabout our first Village Continuum in 2014. Visit me at the Lost Trades Fair on the 7th/8th March 2015 or check out my Facebook page and get in touch. I’d love to share more of this with you.